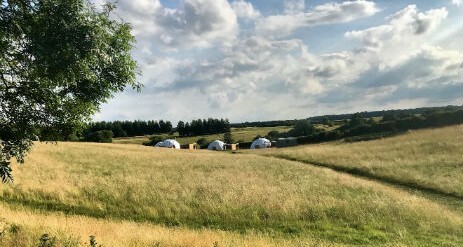 In the Stix is a stunning glamping location in England smallest county of Rutland, bordering Leicestershire. 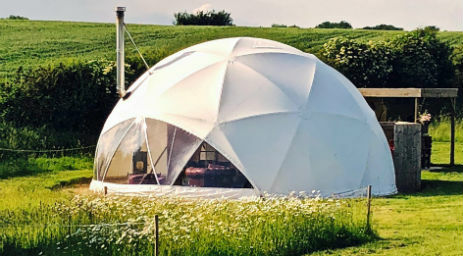 Our guests can reconnect with the great outdoors in our unique functional and luxury domes. 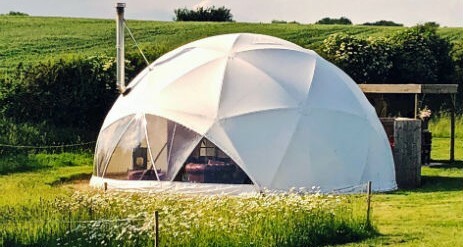 Our domes provide all the conveniences you need but without losing the campsite classics of outdoor cooking and campfires. This is camping but definitely not as we knew it! 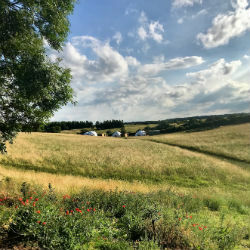 In the Stix is about spending uninterrupted time with your family, about leaving behind the stresses of work, the phones and tablets and getting back to nature. From the moment you arrive you can relax in your surroundings knowing everything has been provided for your convenience. All you have to do is enjoy spending time with your friends and loved ones in our sensational setting. Sit back and enjoy a glass of wine on the chesterfield leather sofa next to your log burner and appreciate your spectacular views. 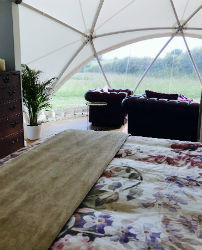 We currently have 4 geodesic domes with their own personal Hot Tub, set in a beautiful valley, carefully positioned to achieve privacy, but not so far apart that you leave on Monday morning without having conversed with your neighbours. 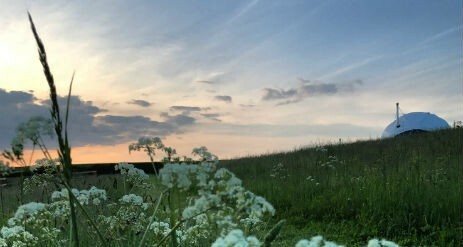 We aim to create a community in the countryside and would like part of your experience to be meeting new people and forming new friendships. 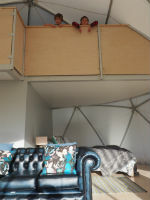 Our individually designed domes can sleep between 4 and 6 adults or children plus 2 cots. 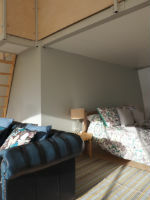 There is a unique mezzanine design allowing privacy for the bedroom and bathroom below whilst also providing a fun space above for up to 4 more guests to sleep. Beds can be made up to suit each individual party, as singles or king size or super king (we don’t believe in double beds!). You also have our very own bathroom with a flushing toilet and shower, sink and hot and cold running water. 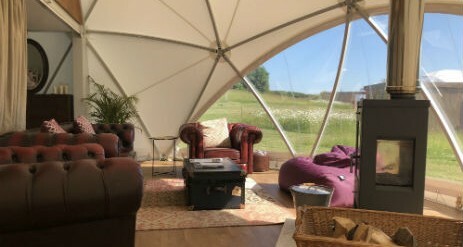 Each dome has it’s own private field kitchen. 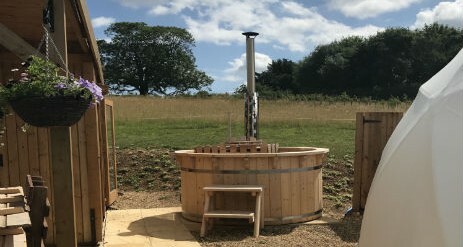 It’s a separate structure next to your dome and will consist of a log burning oven for cooking and two ringed gas hob to enable that fast morning cuppa. 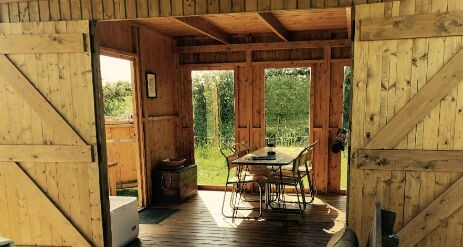 Your family table and chairs are here for those outdoor meals and the kitchen is fully equipped with all cooking utensils, pots, pans, crockery and cutlery, kitchen roll, cling film, foil, bin bags, washing up essentials, tea towels and hand towels, are also provided. 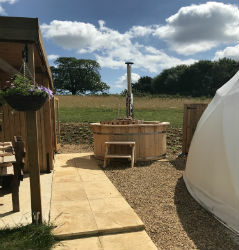 All of our domes have beautiful wooden log burning hot tubs. Just light the fire and relax! Our favourite place to eat is our village pub, which is a very pleasant 10-minute walk from the site along the brook. Children and dogs welcome, a fantastic welcoming atmosphere and the most amazing food all on you door step!